Book Monday– Gail Carriger’s “Changeless” | STEAMED! Happy Monday. I have a new book review for you today. First off, congratulations to author Paolo Bacigalupi . His novel The Windup Girl won the 2010 Nebula Award. I’m also having some major tiara envy. I saw this on Etsy. Isn’t it darling? 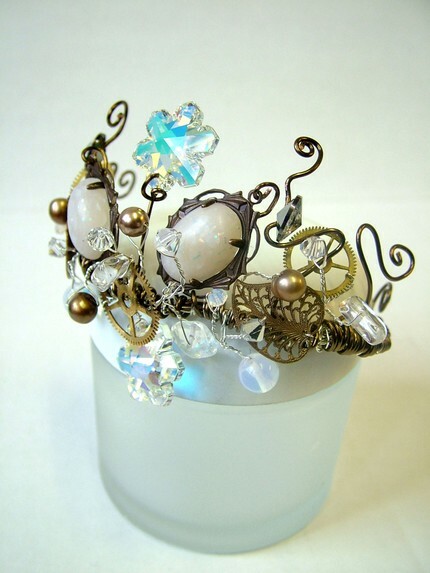 I know, I own two clockhand tiaras, but there’s something about this one I really like. Maybe it’s the snowflake? The Steamed blog (and my upcoming book) were also mentioned on the Romantic Times blog. Squee. I have a few more copies of issue 6 of Steampunk Tales. If you want one, just let me know in the comment box. On to today’s book review. I have to say, I do adore these books and I can’t wait for the next one. The fearless, yet well-dressed and ever-so-proper Alexia Tarabotti is back in this second novel of the highly entertaining Parasol Protectorate series. This time, Alexia is off to Scotland with her bratty sister, her best friend Ivy and Ivy’s collection of horrid hats in search for her missing husband and to solve the mystery of why supernaturals in London are loosing their powers. Like in Soulless, adventures and entertaining characters abound in the wild romp into the Scottish highlands. Alexia travels aboard a dirigible, uses an aethographic transmitter, brings her rather unusual parasol wherever she goes, and befriends the inventor Madame Lefoux who (gasp) wears trousers. There are also Weres in kilts (who doesn’t love a Were in a kilt? ), plenty witty banter, marvelous gadgets, and more world building (the octopi from book one are finally explained). The new characters are very colorful, such as Madame Lefoux, but we still see our favorites like Ivy, the Professor, and the wildly flamboyant Lord Akeldama. The relationship between Lord Maccon and Alexia starts out as sweet and funny, but as the end approached I found myself wishing I could smack him with my parasol. Like the first book, I found Changeless to be an entertaining read with a well thought out Steampunk world, clever characters, and witty dialogue. The combination of Steampunk and paranormal is what, to me, makes this series so much fun. I really liked Changeless as well, Suzanne. It strikes me that there isn’t anyone else out there writing this kind of story. The pacing is so different than other supernatural stories, with an emphasis on dialogue, setting, characters. Alexia is a one-of-a-kind character, but it’s really Ms Carriger who is the shining star. I think she could make the phone book a fun read. I hope we see more of Madame LeFoux in the next book, Blameless. And–I cain’t wait for the story to move to Italy! Me, too. Antonio. I just love this series. Thanks for stopping by.